I tend to make things in bursts. I'll go heavy on cuffs for awhile, then get sidetracked by pouches or belts... And, regretfully, the need to sleep and do housework really eats into my crafting time! My Earth Medallions have been on my to-do list for awhile now, but it's only recently that I've been able to pry loose the time to translate the desire to make more into action. Don't forget to check there weekly to see what's new! This is Desmond, newest light of my life! 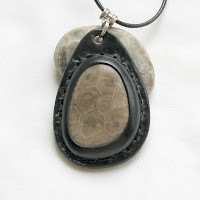 He's a yooper, which means he's from Michigan's beautiful Upper Peninsula. Did I mention he's my first grandchild? 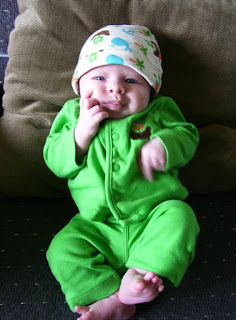 Well, just so I can get it out of my system, here's a picture taken on his one-month birthday. Looks like he's contemplating things of great gravity and importance, doesn't it? Gotta love the lime-green outfit! As I'm sure I've mentioned before, one of my favorite things about reaching customers via the web is the international scope of my clientele. Every time I ship to a country for the first time, I place a pin on an imagined map; the map is getting new pins all the time, and I just love that! Recently my daughter and her dashing husband spent a week in Italy. 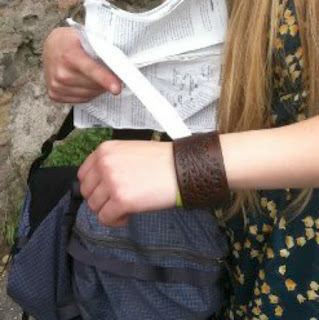 One day, while waiting for a bus on the streets of Rome, they spotted a woman wearing one of my signature Floral Vine cuffs. This lovely lady, a fellow tourist from Canada, graciously allowed them to take this picture of her pointing at her cuff. 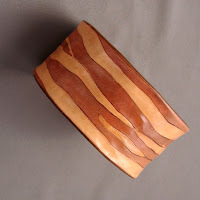 This cuff, my most popular design to date, is always available in my Etsy shop - click here to go directly to the listing. 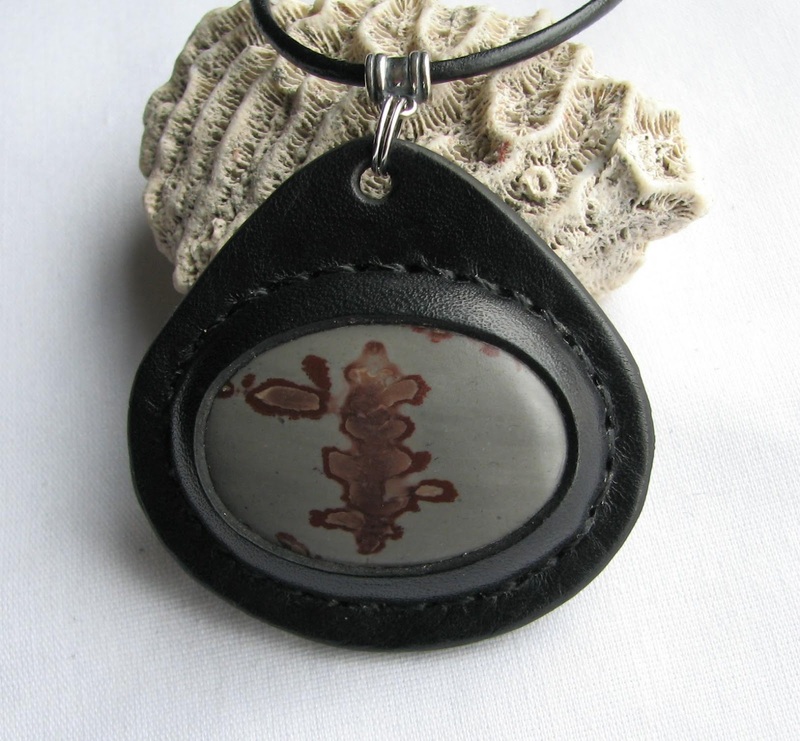 Each and every one is made individually, so each is a unique piece, a bit different in flow and character from all of its international counterparts! 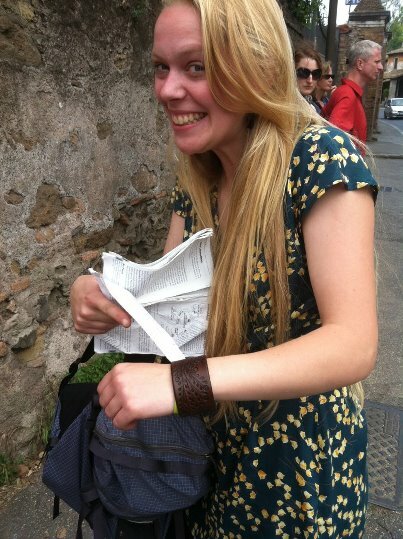 And thanks so much to this lovely Canadian adventurer, who didn't share her name. I appreciate your sense of style and that big smile! Though I've never stopped making belts, I did stop selling them in my online shops for awhile, except on special request. To be honest, this was a decision born of frustration with difficulty in sizing issues. I'm not sure if it's because of the lack of uniformity in sizes in the clothing industry in general since the advent of so-called vanity sizing (where what used to be an honest 38" waist is now passed off as a 36 or even a 34) or if it's human error on the part of the person taking/sending the measurement. Perhaps even a mistaken reliance on an old belt or pair of jeans that has stretched? Whatever the cause, the result was that nearly half of the belts sold online were coming back to me due to sizing errors. Of course, everyone was very nice about it, realizing that I can only send the size requested; I cannot magically determine if the info is correct. Still, it was vexing for the customer, requiring extra wait time and postage as they sent the wrong size back for exchange. And, from my point of view, a bit frustrating as well... if there is one thing I strive to never have, it's a vexed client! 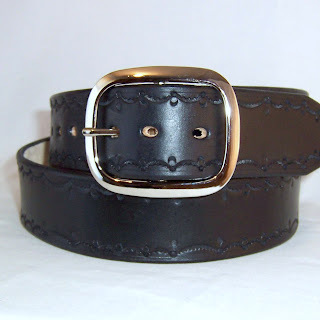 All that said, the one thing you cannot ask a belt maker to do is stop selling belts. So, after much thought and consideration (and more than a few requests) belts are coming back to my online venues, starting with a few at Etsy. The selection will grow over the next several weeks and will be expanded to my stand-alone website as I get that re-worked. I've tried hard to try to make the sizing information-exchange easy and clear... if you check out the listings and have any suggestions for improvements, I would love to hear them! 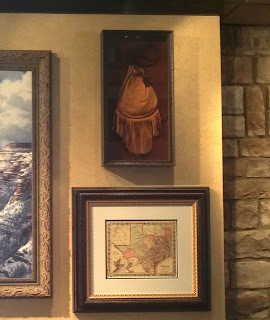 In March I posted about my pouches being featured in Longhorn Steakhouse renovations throughout the country. There's a contest attached - you can find the details here. To get you in the spirit (and to remind you about the contest), here's a picture of my niece at the Round Rock, TX restaurant, standing beneath the first of my pouches to be installed. 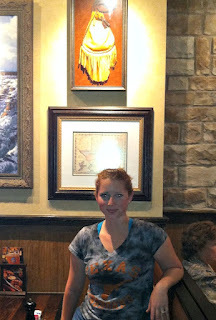 Sorry, Kelly - both you and the Round Rock location are ineligible for the contest. Thanks, though, for the great pic!! Now everyone else - get out there and find one near you! 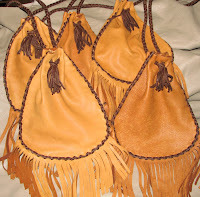 First person to send a similar picture from a qualifying location wins one of these awesome handcrafted pouches... I just sent out a new batch - there are now nearly 20 potential locations that could win for you! Good luck! What's not to love about the feel of deer hide? It's soft and supple with a grain that stretches and forms to suit its task. 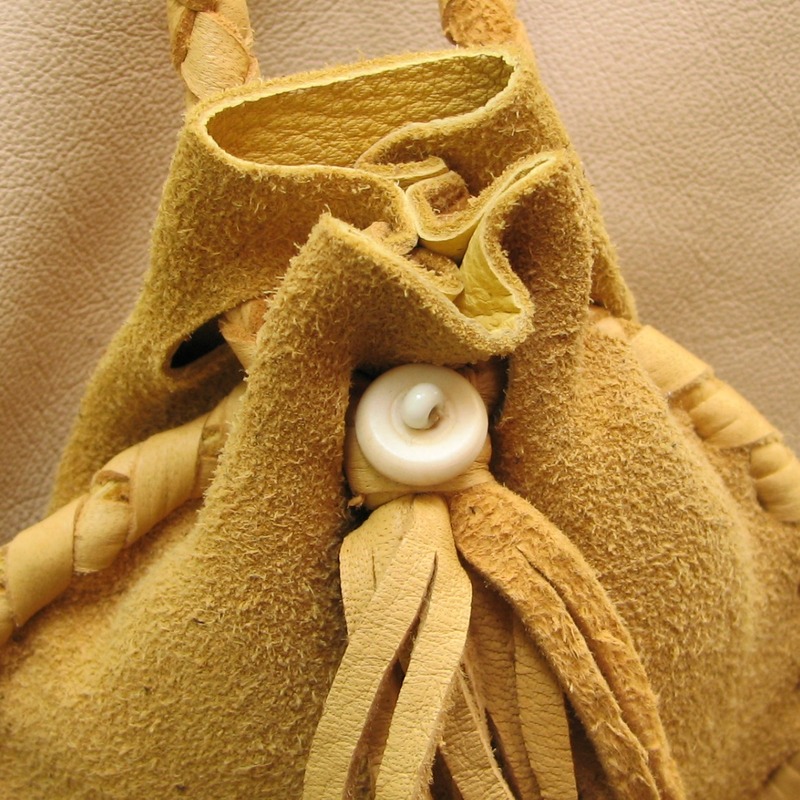 Pouches, bags and clothing made of deer hide will last longer than other leathers of similar weight, even under punishing conditions. Use cold water, a gentle soap like Woolite and the gentle cycle. Block to shape when it's done and dry on a sweater rack away from sun or heat source. (smaller items can be hung to dry). Your item will be slightly stiff once completely dry but will soften quickly with use. I'm in the middle of a new batch of pouches - there are several new ones listed in my Etsy shop (link at top of the left sidebar) and more to come over the next week or two. 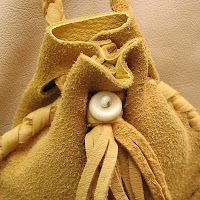 They all have round-braid straps and most have fringe (for which I have a personal fondness). There are several sizes, different embellishments and every one of them is put together to stay together! 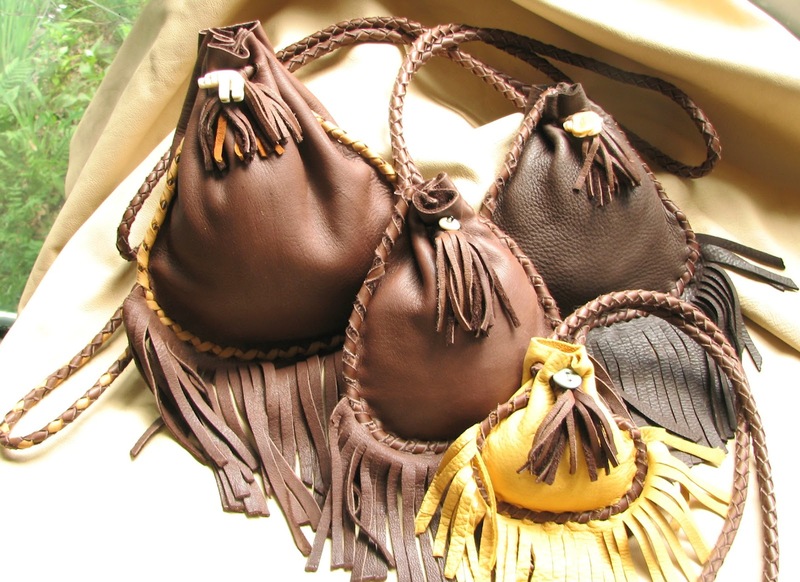 These wonderful bags are suitable for powwows, rendezvous and every day retro coolness! As always, if you'd like something a bit different than what you see, I am glad to consider any custom requests. 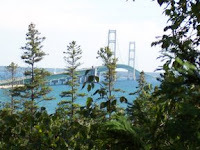 I love the Mackinac Bridge. I think it's beautiful. That's been true since I was a child - it opened when i was a very small girl, but I remember the fanfare. 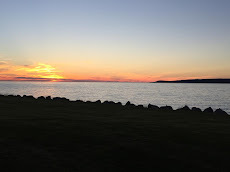 Though more than 50 years have passed since the first car made the crossing, my love of this connecting span and the wilderness that lies to the north of it has never waned. Some people paint the things they love, some write poetry or songs... I did what I do, and tooled this wristband. It's called Mighty Mac and you can find it in my Etsy shop if you're a bridge-lover, too! When I first started selling online, my shop bio said "over 30 years of experience". Though the number seemed larger than memory would have thought, it was a badge of pride. Validating. Then, a blink of an eye ago, I had to change it to 35 years. wow. How did that happen? Surely my math was faulty? But no, double-checking and triple-checking with a calculator bore out the claim. Didn't seem possible, but the numbers told the tale. And now, again, another milestone. 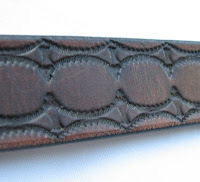 I tooled my very first belt in the beginning of April, 1972. That means it has been more than 40 years that I've been plying my trade. Holy Cow! 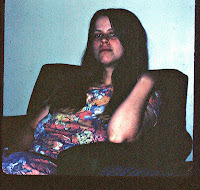 I was a 17-year old hippie chick when I went to work for Chuck at Silo Leather in Birmingham, Michigan. He didn't pay me a wage, but I was learning a trade. 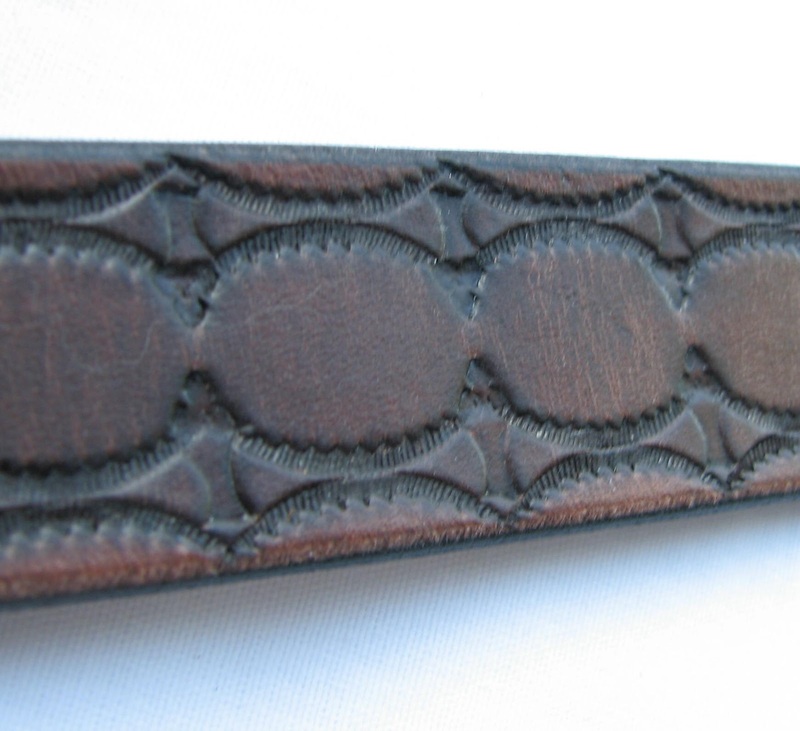 For every third belt I tooled, Chuck gave me a blank strip of leather. 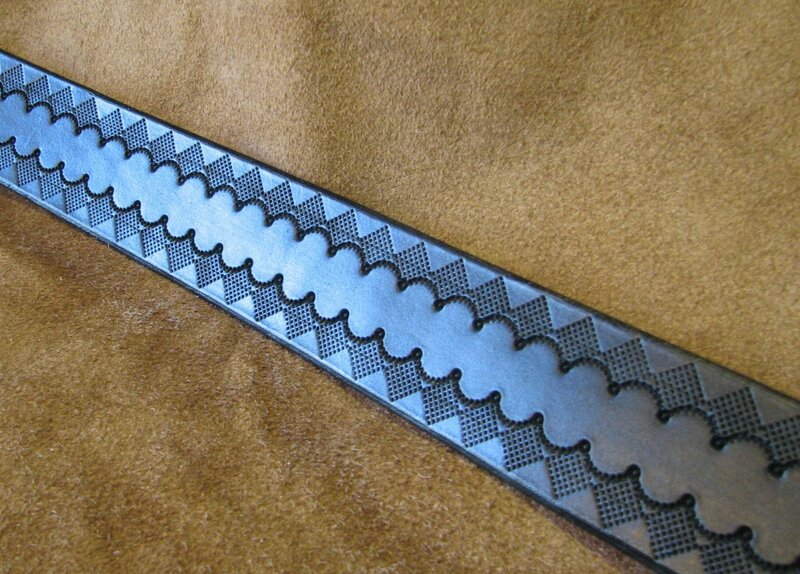 For every 10 belts, a new stamping tool. Chuck built his inventory and I built a starter tool set and a supply of belt strips I could work up and sell on the streets or at festivals. 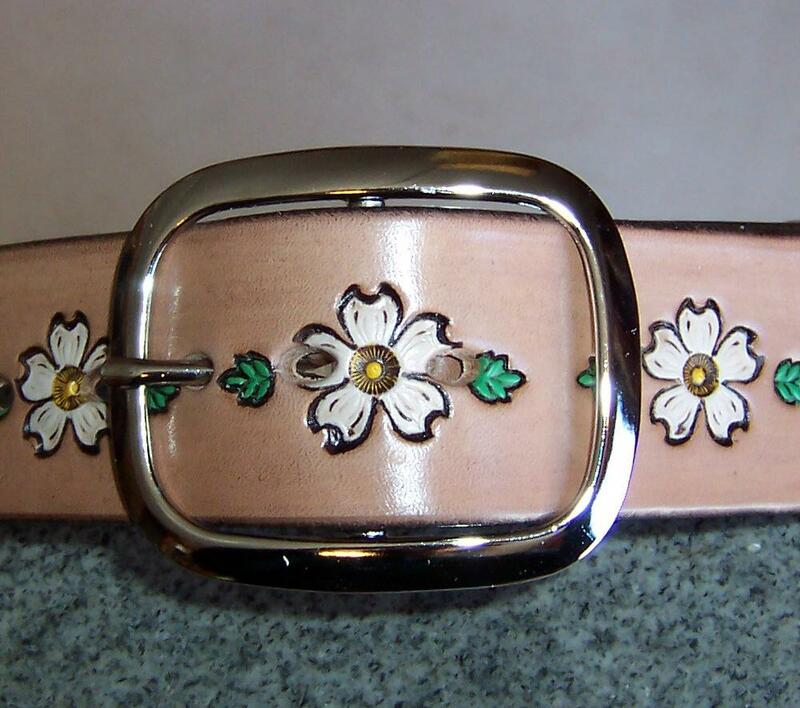 Lots of floral-vine belts or sunburst motifs. I liked fantasy, so I did some playful belts with elves sleeping under toadstools or dragons belching flames. 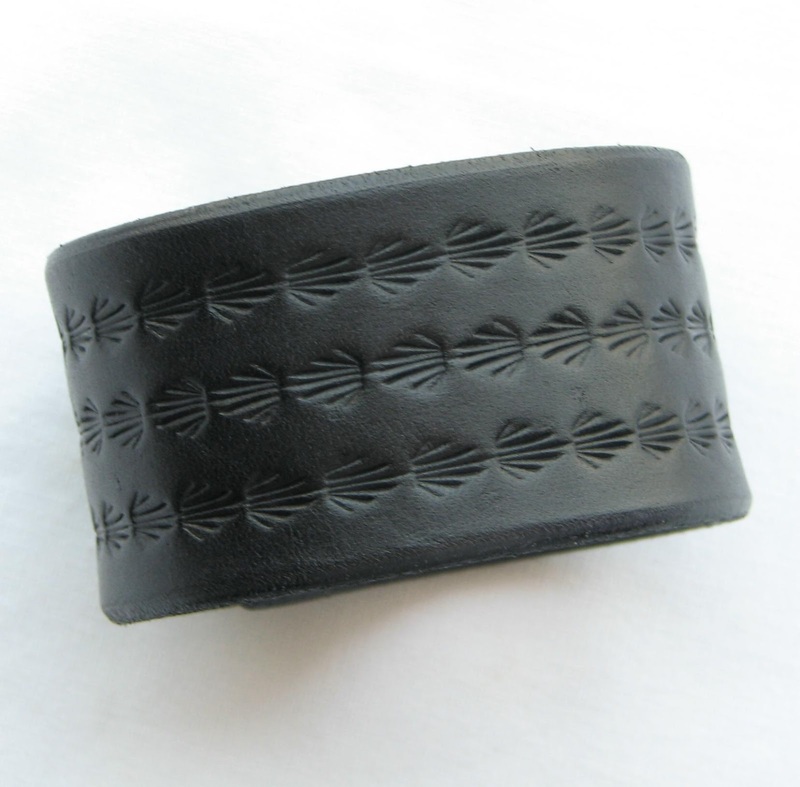 My belt tips all had a signature scalloped cut. I wish I could post some pictures of some of my earliest work, but I sold it almost as fast as it was made (like I said, Chuck didn't pay a wage). I'll have to settle for posting this grainy pic of teenage me, as well as a more current photo. 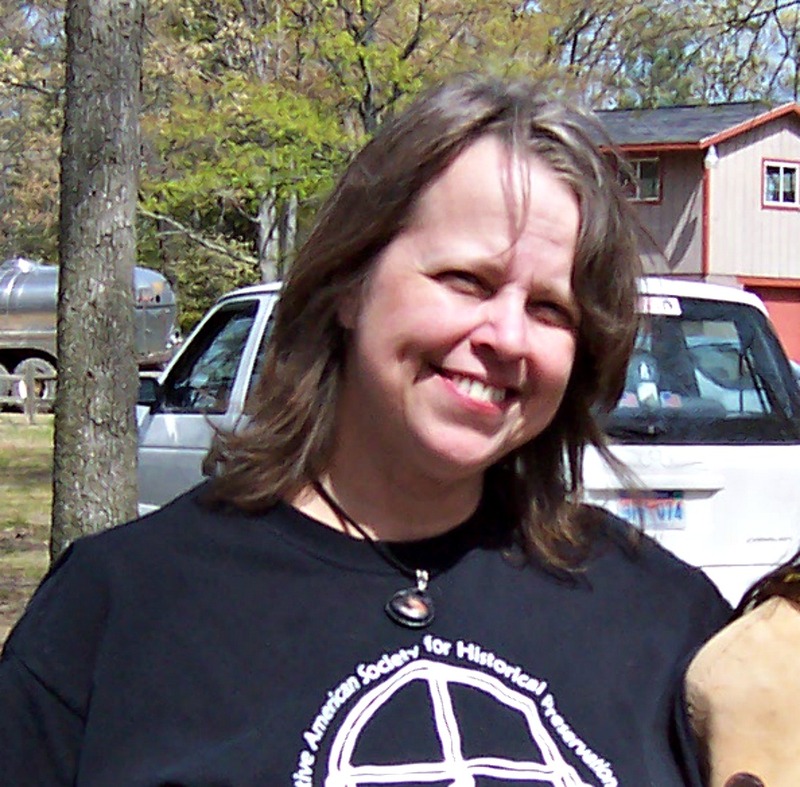 Yes, I guess the years become obvious when I look at then vs now. Chuck is long gone, as is Silo Leather. But I carry on. 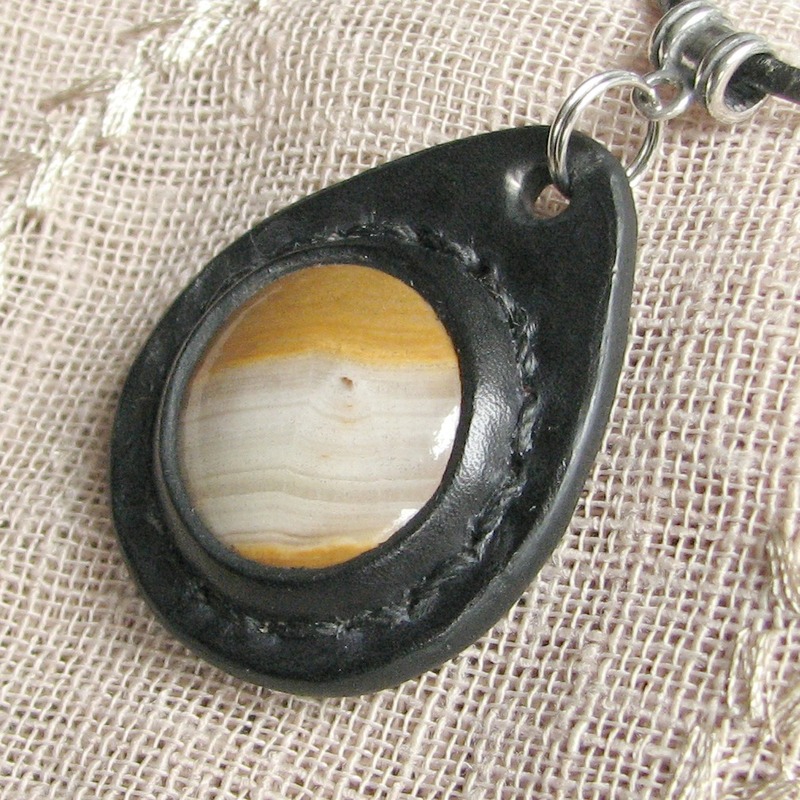 I have been working with leather more than 2/3 of my life and I can't imagine I'll ever stop. And that, my friends, is a milestone worth sharing! 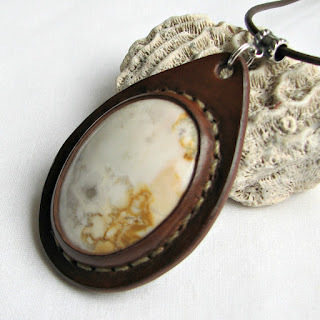 There's something new in my Etsy shop - Leather Chokers! Hand-tooled on high-quality belt leather, I've lined these with some lovely soft garment leather so they're cushioned against your neck. The tie-on styling allows them to accommodate a range of sizes - they can be worn by women or men. 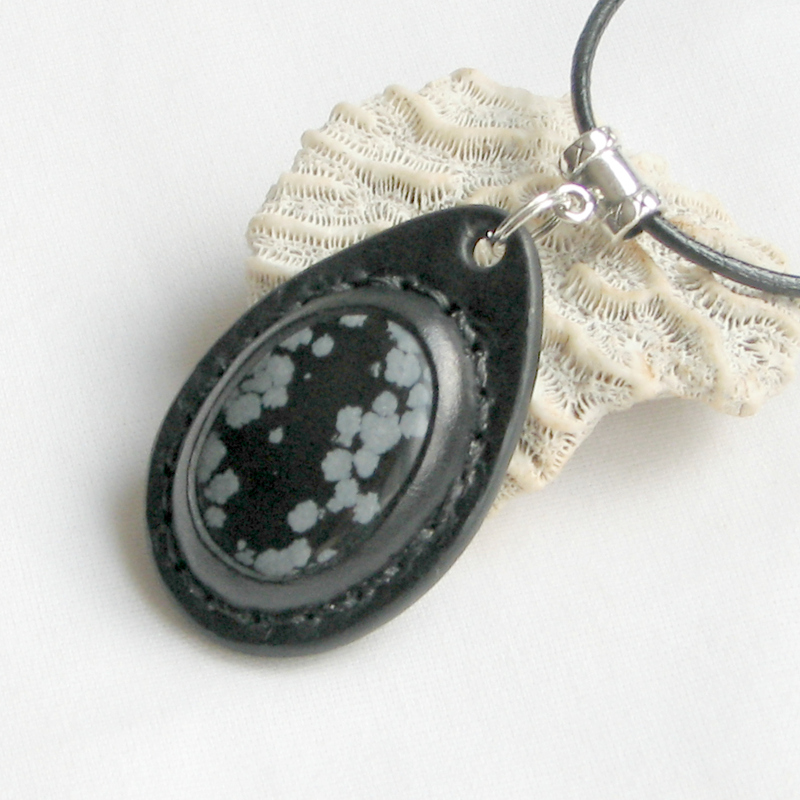 This is just one of the designs in stock - you can see more in my Etsy shop, linked at the top of the left sidebar. And, of course, I'm open to any and all design suggestions or custom requests! People have been seeing pictures in stone since time immemorial, I'm sure. Some have clearer pictures than others, but all tell their own story. You can see hints of that story in the blends and swirls of color or texture in many of the rocks you examine. This one really caught my fancy - it's a lovely piece of Eagle Eye Agate, the newest Earth medallion listed in my Etsy shop. The variations of white and earth tones paint a winter landscape with a lone traveler making his way into the whirling snow. At least that's what I see - you may see something totally different. 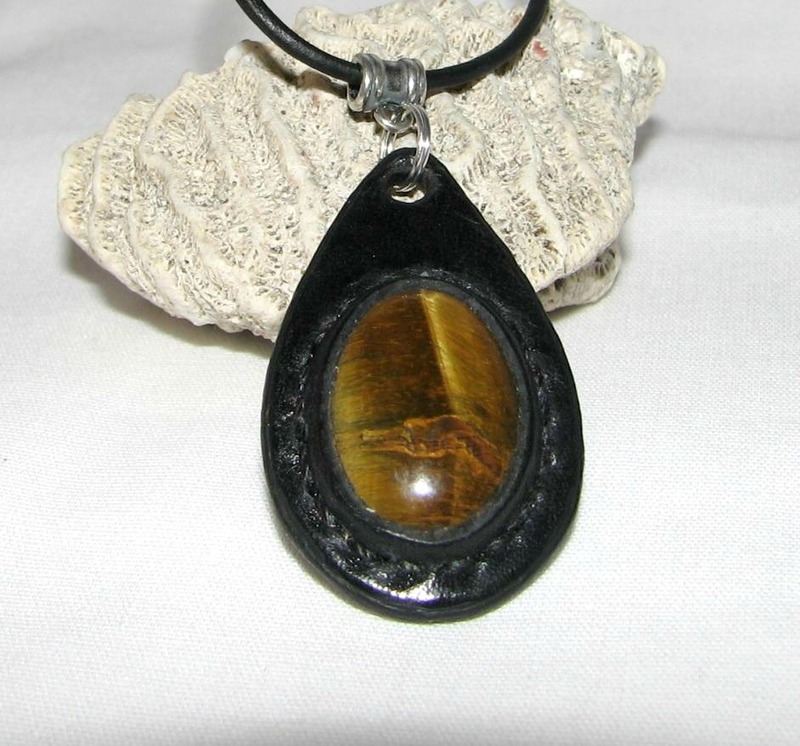 Here are a couple more from past pendants: do you see the dragon's head in the tiger eye below? 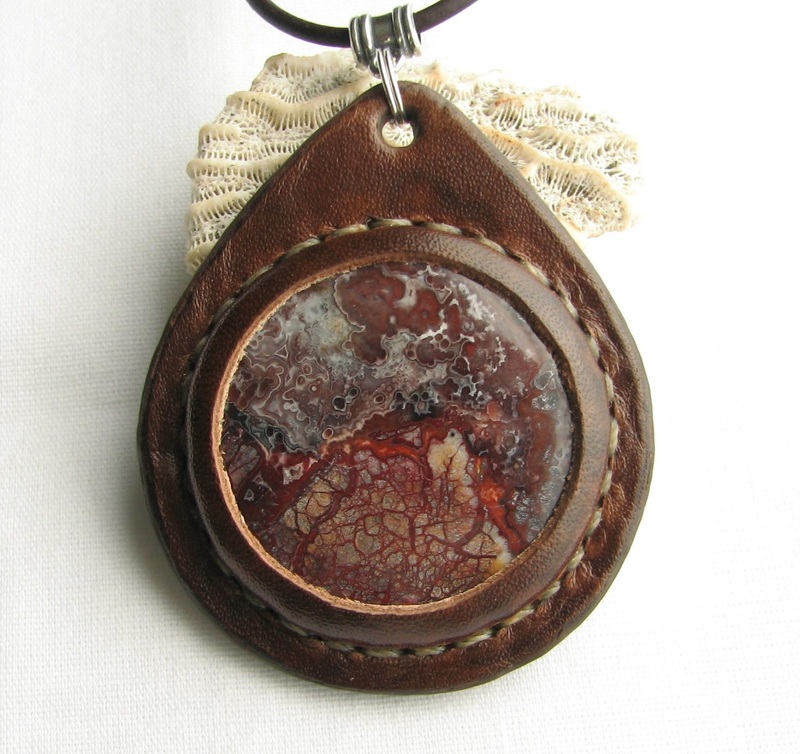 The Crazy Lace Agate to the right is a straight-up volcano from some enchanted land in great turmoil! Of all the great artists, Mother Nature is my favorite! In anything you do, it's good to have fun, right? And I do! I made the bacon cuff to the right just recently, inspired by a silly picture on Facebook. I laughed the whole time I was working on the texture and the coloring. It brought to mind a few other things I've made just for the silliness of it. The silliest stuff, regrettably, has no photographic documentation... like the purses I used to make with silhouettes of my daughters' hands on them. I called them HandBags, of course. And the rabbit-hide nose-warmers - theoretically a great idea if you live in Northern Michigan, but if people can't get past the way something looks, a good idea goes to waste! Fun is good - I recommend that we all get all that we can on a daily basis! Most of us have eaten in cleverly decorated chain restaurants at one time or another. If you're like me, you may have given a bit of thought as to where those decorations came from. If pressed to come up with an answer, I might have guessed that there was some sort of background-type business that supplied interesting decor based on themed requests, and i would have been a bit right... what I would not have guessed (but now know) is that those decor-supplying marketing firms often get those items from people just like me! 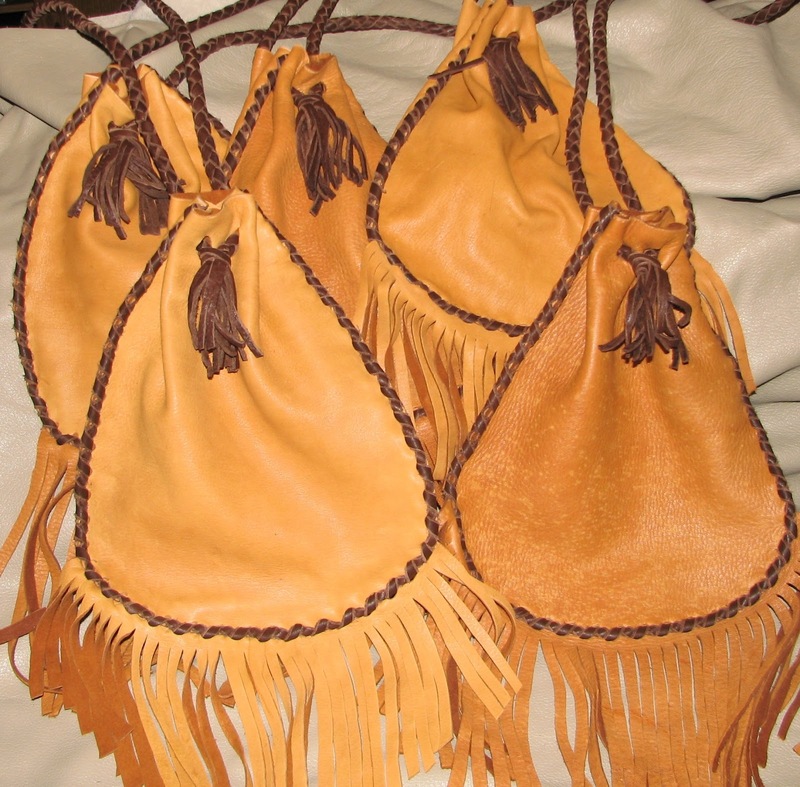 My deer hide pouches are now to be shadow-boxed and featured in a number of Longhorn Steakhouse locations across the country. The one pictured here is in Round Rock, TX. (This tickles me on a personal level, as I have family there). From what I've been told, they also are or will be in some (but not all) of their restaurants in Texas, Florida, Ohio, Pennsylvania and Georgia, to name a few. So here's the contest part of this post: The first person to send me a picture of one of my pouches in its shadowbox in a restaurant will win one of the pouches! 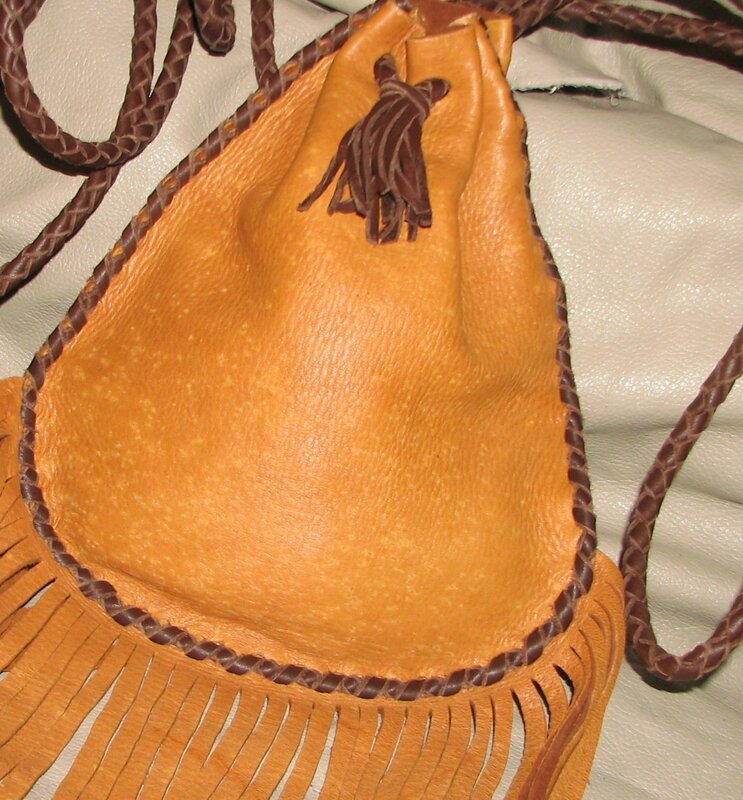 (sorry - since I've already posted it, The Round Rock location is disqualified from this contest) This is a large fringed pouch, made of soft sumptuous tobacco-colored leather with dark brown stitching and round-braid strap. All you need to do is post a comment here telling me you have the picture and where the Steakhouse is located. I will provide you my email address so you can send me the picture. Then, upon verification of the photo and location, I'll send you your very own "Longhorn" pouch. Again, Round Rock, TX is NOT a qualifying location. 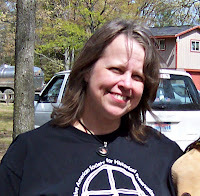 The winner must allow me to post their photo on a blog update. This contest is limited to one winner, based on the first verified photo. All decisions of a winner will be made by me and are final. Let's have fun with this, folks - based on the number of pouches I've supplied thus far, there are a dozen opportunities for success out there with more to come soon! And, though I probably don't need to say it, I have pouches available for purchase in my Etsy shop, linked to the left... this size pouch is not currently listed, but I'll be glad to fill any custom requests - just contact me for more info. Thanks!